One week is devoted to the meeting of about 35 artists, representing heterogenous behaviors, which are to be found in the Live Arts. This is why, with the different themes we will deal with: Poetic Partition, the Body, Art Action and Intermedia, in 4 evenings the artists will create a dynamic situation; thus, they will take advantage of the work previously done in relation with the public. Thefore, a dialogue and a game, integrating chance and the unforeseeable, will take place. A seminar has been scheduled for the 1st of May which will treat the current relevance of the Live Arts, the implications of art today's social, alternative processes. It will attempt to create a situation conductive to theorical and critical considerations of current practices, the historical perspective having recently been considered in Quebec (c.f. 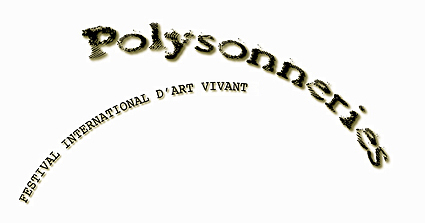 international congress and seminar of interactive art, Art Action 1958-1998, October 20-25). With the participation of artists, Pierre Restany as moderator and main organisers of international festivals as participants will present and open discussions. Part of this program will take place with the participation of people coming from the problematic urban backgrounds, and will welcome the participation of social structures already active in these areas. The cities of Venissieux and Saint-Fons have already been considered concerning this action.